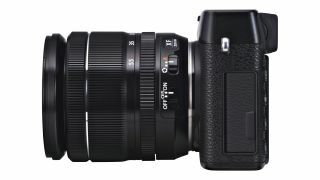 Fujifilm has added two new lenses to its premium X series interchangeable lens camera ranges, to work with the Fuji X-Pro1 and the new Fuji X-E1. First up, the XF 18-55mm f/2.8-4 R LM OIS lens is the first zoom lens made for the X series of compact system cameras (CSCs). With a wide aperture of f/2.8 and an all-metal construction, the company is keen to point out that the lens is not an average kit optic. Constructed of 14 elements in 10 groups, including three aspheric and one extra low dispersion element and seven-blade rounded diaphragm, the lens is designed to work well in low light conditions. A linear motor-driven system delivers high-speed autofocus performance of 0.1 seconds, while silent operation is also particularly useful for video recording. An Optical Image Stabiliser, equivalent to 4 stops, is on hand to help control the effects of camera shake and to prevent blurry shots. The lens is also equipped with an aperture ring so you can easily adjust aperture while holding the camera up to your eye. The second lens announced is the XF 14mm f/2.8, an ultra wide angle lens featuring an advanced optical design for overcoming the distortion tendencies of lenses of this kind. Constructed of 10 elements in seven groups, including two aspheric and three extra low dispersion elements, the lens also has a seven-blade rounded diaphragm for fantastic shallow depth of field shots. Both the Fujinon XF 18-55mm f/2.8-4 R LM OIS and Fujinon XF 14mm f/2.8 lens prices have yet to be announced, as has availability.